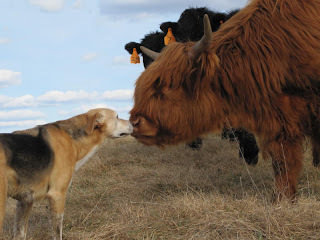 We will be trying out some new types of cattle to see which breed is the best match for our grass-based farm. So far we've been getting calves born on other farms to finish raising here, but we would like to eventually have all our calves born here where they can be raised at their mothers' sides. We want a strong healthy breed, that does well on pasture, doesn't require any grain, and produces excellent meat. 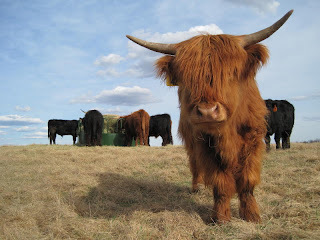 This year we will compare Scottish Highland and Lowline Angus to the Jersey we already have. The new animals arrived over the weekend. Farine was kind enough to offer an official farm welcome to the newcomers.